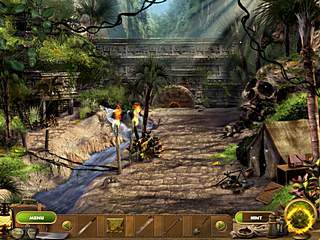 Escape from Thunder Island is a newly released hidden object/adventure game. The game takes you to an island where strange things live. The game isn't really one of the outstanding ones, but it seems good for kids or those who do not have very high standards for the games of this genre. The dialogues are full of jokes or sarcasm aimed to create the chracters images. You play as a young aviatrix Rita, who headed to an island to find her father. He came there before her, but something happened and he got kidmapped. So she is now going to go and rescue him and get out of the island. The landing wasn't a success, and now, the plane needs some repair, which can be performed by Rita's friend and the human half of her crew. The other half is a monkey. The dialogues are full of jokes or sarcasm aimed to create the chracters images. So, that would be an introduction to the game. You will get to spend a lot of time on the island exploring many things. You will also collect coins in every location in order to get a reward afterwards. You will have to pick up many things too, some from the locations, some from the hidden object scenes. Those go to you inventory and get to be used a lot. That even seemed a bit too repetitive, when you have to go take the shovel and dig in order to get the tablets, and you do that over and over again. But some may disagree, of course. There are also diferent mini-games along the way. Those are pretty simple and familiar. 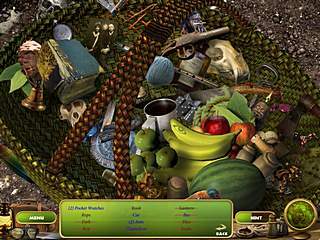 The hidden object scenes follow the classic path. You are given a list of items and you have to find all of those on a scene. Some of the items tell you how many of that you need to find. Other combination of hers include the combinations of two or more things. Random clicking is punished, but hints are provided. The graphics are very simple being the reason for me to say that game is not for those who expect a lot story-and presentationwise from the game. I'd have to pass on with you here. Which is not stnhoeimg I usually do! I really like reading a post that will make people think. Also, thanks for allowing me to speak my mind! This is Escape from Thunder Island review. Download this game here.